Peanut butter and jelly sandwiches are a staple in any kid’s lunchbox or after school snack arsenal. I mean, even if you have a peanut allergy, you have probably had at least a nut butter and jelly sandwich. They are certainly a comfort food, aren’t they? Well as fast as a PB & J is to make, making a smoothie is pretty much just as fast and great for sipping on the go! 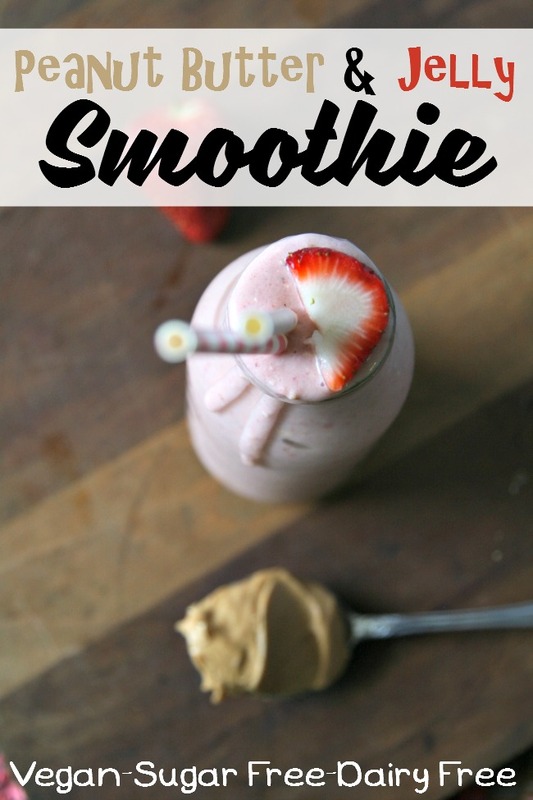 This peanut butter and jelly smoothie is great for post workouts, too because it has added protein and can easily be made vegan. 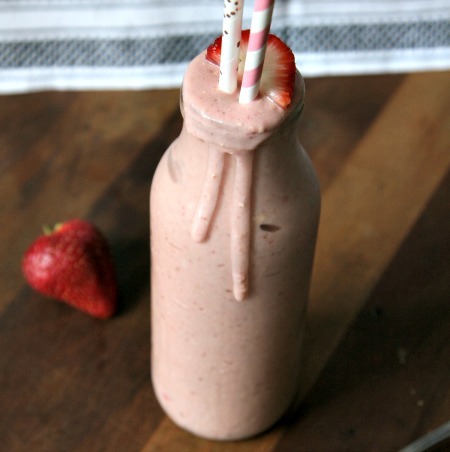 Add strawberries, bananas and almond milk in a blender. Blend until smooth. It will be sort of watery. Add Peanut butter, and blend. Finally, add in your oats and protein powder. Blend until incorporated well. If you desire, you can add a few drops of stevia extract to sweeten it, but I found it sweet enough. 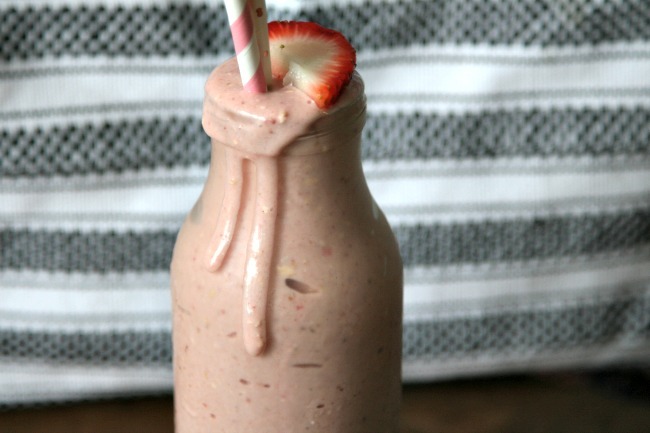 This smoothie is super filling and is great for a breakfast. This recipe makes 3 small smoothies or 2 larger ones. **For the bananas, I keep a constant stream of them in my freezer. I buy 2 bunches of bananas when I go to the store to stock up on them. 1 bunch is to eat and the other is for me to make into banana slices for our smoothies. Just simply slice them (I like to let them ripen a few days so they are super sweet before I freeze) and line a baking sheet with parchment paper. I place them in a single layer on the parchment paper and place it in the freezer for 4-5 hours. they get frozen solid in that time and I slip them into a freezer bag or container. this makes them easy to use! For the bananas, I keep a constant stream of them in my freezer. I buy 2 bunches of bananas when I go to the store to stock up on them. 1 bunch is to eat and the other is for me to make into banana slices for our smoothies. Just simply slice them (I like to let them ripen a few days so they are super sweet before I freeze) and line a baking sheet with parchment paper. I place them in a single layer on the parchment paper and place it in the freezer for 4-5 hours. they get frozen solid in that time and I slip them into a freezer bag or container. this makes them easy to use!